Ever wish there were a charger for your phone or other mobile devices that you could just slip into your wallet? You know, something small and streamlined that would take up no more room than, say, a credit card. They have those magnifying glasses that light up that are approximately that size, so why not a charging device? Well, now they do. 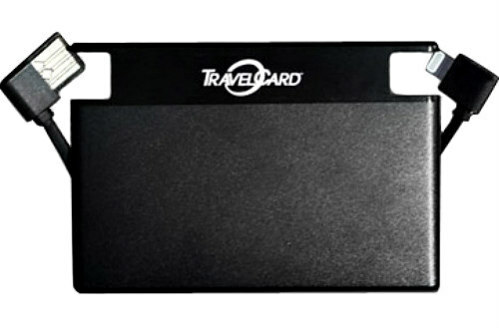 It’s called the TravelCard, and not only does it charge smartphones, but it fits in your wallet with ease. If you haven’t heard of it, you’re going to want to check it out. The TravelCard comes with two built-in charging cables so you can charge your phone and the TravelCard with ease. It’s the first slim-line portable charger with a charge and sync feature. It’s being called the ultimate charger for people on the go. If you use your phone a lot and you’re constantly finding yourself running low on battery away from your home or office, then this is the charger for you. It comes in two designs: one to accommodate all Androids with micro USB ports and another to charge iPhones 5, 5C, 5S, 6, 6 Plus, 6S and 6S Plus. There are tons of phone chargers out there right now offering a multitude of attractive features, but this is probably the most convenient to carry. 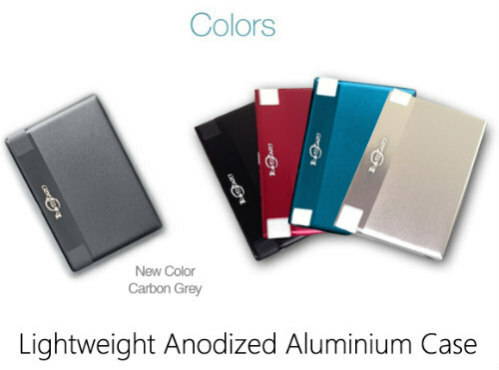 The TravelCard comes in a variety of designer colors in a lightweight anodized aluminum case that can be shoved in a pocket without fear of destroying it, should you happen to sit down. The sturdy yet sleek 3 3/8"L x 2.13”W x 3/16”D design weighs only 1.9 oz. and features 1500 mAh (milliamp hours) that allows for five hours of talk time. You can plug it into your laptop when the device itself needs a charge. While the current trend in mobile phones seems to be getting larger, chargers — thankfully — are getting far more compact and multifaceted. There’s even a smartphone charger out now that doubles as a sanitizing unit using UV rays to destroy all the germs we smear all over our touchscreens every day. If germs don’t scare you but the thought of mobile devices overheating and starting fires does, there’s a charger with a built-in surge protector and a mini computer to keep your cell phone from overcharging and melting or burning up. 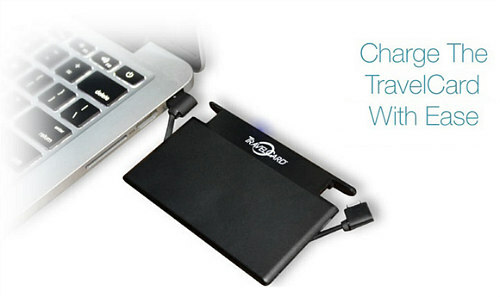 The TravelCard smartphone charger by GoDesign would make a great gift for anybody, including yourself. And, with the holidays just weeks away, it would probably make the perfect Christmas gift for a number of friends and family members on your list. Besides people on the go, this particular charger would appeal to techies and teens or anybody that’s big on having the latest in cool gadgetry. Now, you can hook them up for well under $50 if you order it in the next two weeks during the product’s introductory period. After that, it’s anybody’s guess what they’ll go up to.